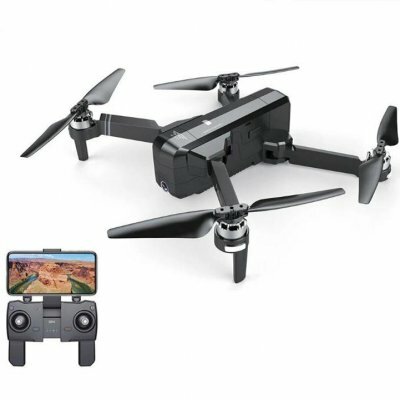 Successfully Added SJRC F11 GPS 5G Wifi FPV With 1080P Camera 25mins Flight Time Brushless Selfie RC Drone Quadcopter to your Shopping Cart. Advanced 5G WiFi 1080P HD Camera: The upgraded camera with 120° FOV (field of view) lens gives a panoramic view for recording your unforgettable moment. GPS assisted flight: Provides you with accurate positioning details of your drone. Built in Return-to-Home (RTH) function for safer fly. 25 Mins Max Flight Time: The High-capacity 2500mAh intelligent battery yields up to 25mins flight time. Follow Me Mode: The drone will automatically follows and captures you wherever you move. LIKE ALL "DRONES" NOT EXACTLY WHAT IT SAYS IT DOES. PLUS PRICE WAS LESS LAST YEAR,ALSO GET THE CASE AND EXTRA BATTERIES. SOME "GORILLA GLUE" JUST IN CASE. LOOK AT"SIGNIA FALCON" ONLINE NEW 2019 MODEL,BETTER TECH! Camera is very good quality. Battery is very easy to install.